One of my besties was up from London this weekend so I took the afternoon off work on Friday and met her for lunch. Sushi Waka is on New Briggate (just up from Mint Club), inside there were a few couples eating however it was fairly quiet (not totally unexpected on a Friday lunchtime). We were given the menu and went for a couple of glasses of Pinot Grigio, afraid I’m not sure exactly how much as I can’t find a drinks menu online but I think it was around £5 a glass. I did have one niggle about this, a lot of the wines had been crossed out on the menu. I can totally understand one or two but it’s annoying seeing ‘what you could have had’ for 50% of the wine list. We decided to order a few different dishes to share between us food wise. We went for the Cucumber Hosomaki (£2.90), Asparagus Hosomaki (£3.90), Avocado Hosomaki (£3.50) and Inari Nigiri (£3.20). All of it was really fresh and tasty, the rice was well seasoned and a good texture. I absolutely love inari (tofu which has a bit of a salty/sweet taste) and tamago (sweet omelette) but sadly they’d run out of tamago. Next our naughty dish, I say naughty but only really because I’m trying to eat less gluten at the moment (sushi is a minefield for this anyway). 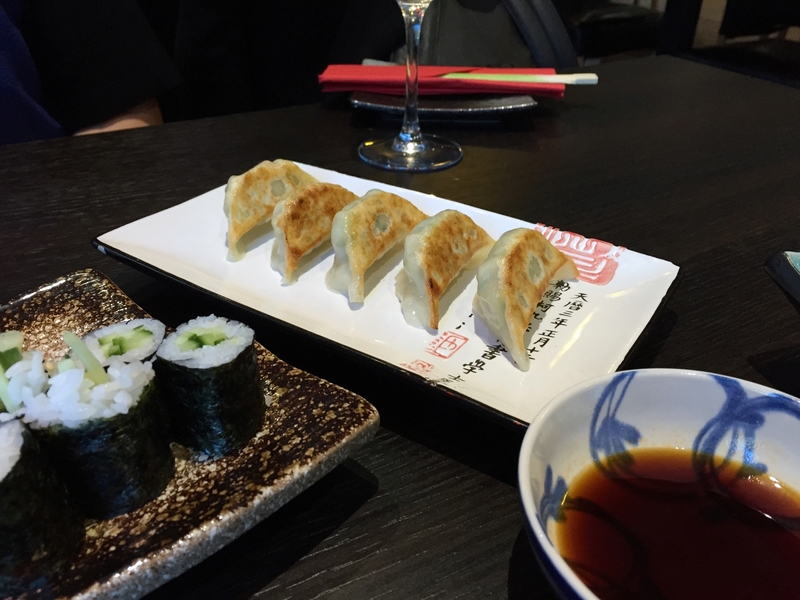 We went for the Chicken Gyoza (£5.20) which were filled with minced chicken and veg served with a vinegar, chive and soy. They were really tasty, I could have definitely wolfed down another plate of them. Now onto the something ‘a bit special’. 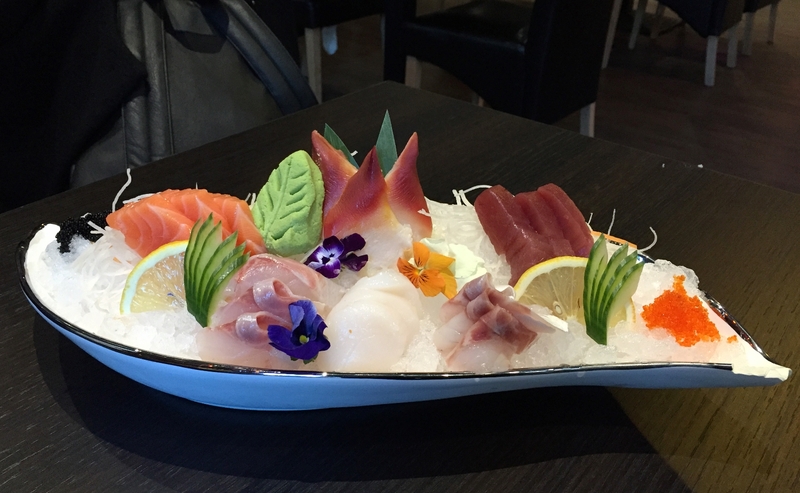 We decided instead of any more pic n mixing we’d have a platter so we ordered one of the Sashimi Platters (£18). It’s a beaut, right? We had salmon, tuna, sea bass, mackerel, turbot, roe and flower of fish. I’m not entirely sure what was what apart from the salmon, roe & tuna. 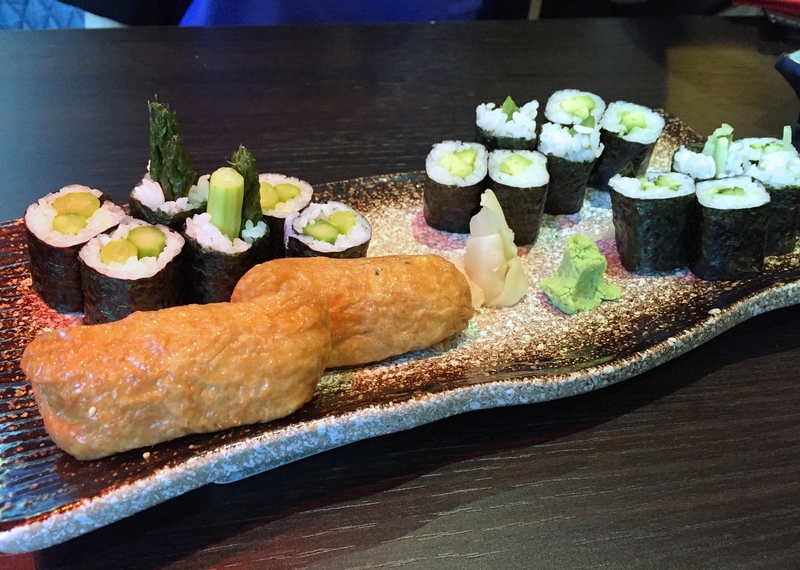 I’m not even sure if flower of fish is a bit of fish or fish shaped to look like a flower. I wasn’t keen on absolutely everything though. The white one at the front was a bit slimy and I didn’t even touch the roe, too fishy for me. My favourites were the salmon (lovely and buttery) tuna (meaty) and the thing at the top that looks like an ombre fin. We were in there for around an hour and throughout service was attentive & friendly. It definitely fit the bill for somewhere healthy but a bit of a treat to visit, and I’d pop in again for lunch (it would be great if they did takeaway too). It’s probably not somewhere I’d go for dinner though as I tend to give myself the night off when I go out in the evening to eat (hello ALL the carbs and butter) but if you’re in the market for something a bit lighter then give it a go. Plus who can resist anywhere that makes a leaf out of wasabi?